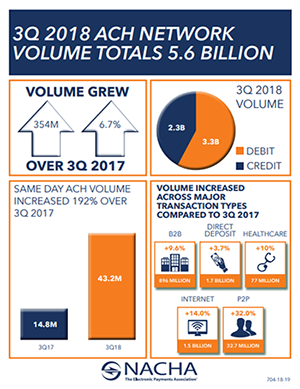 HERNDON, Va., Nov. 1, 2018 – The number of ACH payments totaled more than 5.6 billion in the third quarter of 2018, a 6.7 percent increase over Q3 2017, according to NACHA. The ACH Network’s strong performance is driven in large part by online and business-to-business (B2B) payments. As the ACH Network’s growth accelerates, NACHA, its members, and the ACH Network operators continue to enhance the Network’s capabilities to meet the needs of businesses and consumers. Over the next two years, Same Day ACH will be expanded, with faster funds availability, a higher dollar limit, and later processing hours. There were 43.2 million Same Day ACH payments made in the third quarter of 2018, an increase of 192 percent compared to the same time period in 2017, when Same Day ACH debits were just being introduced. Same Day ACH credits have been available since September, and increased by 90 percent in the third quarter of 2018.